You see Brooke's modeling portfolio and you see this glamorous beauty. Someone with confidence, someone with way more years to her soul than her flawless face shows. Or at least that's the impression I got the day she contacted me. She found me on facebook and sent a few of her portfolio images to me. She then said she was looking to expand that and sent me a few basic ideas she was interested in. Her main goal- it had to be unique, it had to be different, it had to be artistic. And I knew I HAD to do this project with her! The rest of the guidelines? She gave us none. She totally trusted me, and I totally trusted her that no matter what we designed, she would be able to own it. I was right. Then you meet Brooke in person. She's still beautiful, but she's just the sweetest. Where this fierceness in her photos comes from, I'm not sure. It just goes to show you she's a professional at what she does and can transform herself in to these characters. Her smile is so genuine, and her positive personality is truly up-lifting. Again... I can't imagine her NOT smiling when I look at her, but... when she gets in front of that camera, she drops the smile, works it, and owns that area she's in for the time being. We first shot at dusk. We wanted something dramatic, something with a dark, ethereal feel to it so we shot in the back 20 acres of the studio, loaded up the ORV with lights, chairs, fog machine, clothes, and headed back. Dusk quickly transitioned in to night. We eventually shot outdoors with nothing but the flashlight from an iphone and the headlights. Being outside of your element pushes you to see things differently, so it was perfect for all of us! When we went inside Brooke dropped the edginess she had just embraced so well and transitioned in to this delicate, free flowing model, who just so happened to be covered in flour. The way she moved was soft and light. 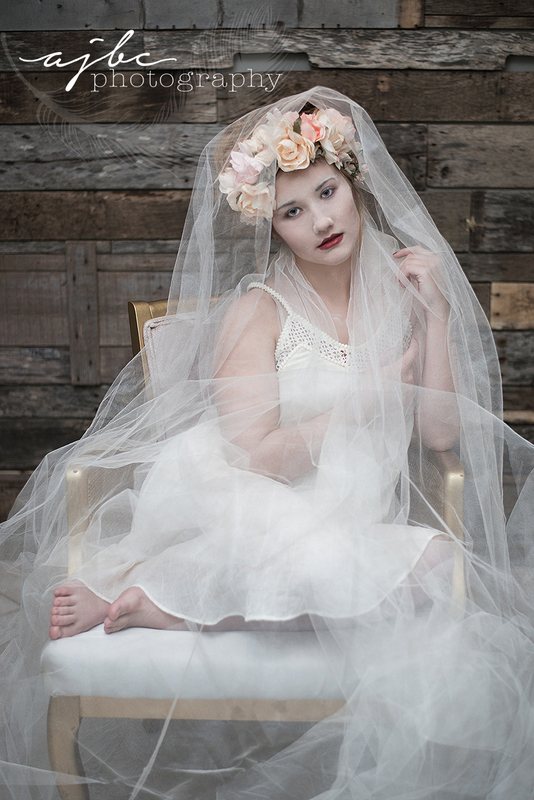 Taylor, my assistant, suggested we shoot through tule we had, which just added to the dreaminess of the whole set. Projects like this make me feel so alive. You're taking your world and expanding it in to this dream like state, which I always have my head stuck in. Watch the beauty unfold below. This whole session was shot indoors and outdoors at the AJBC studio in the Fall! in the Winter for Aubrey's Senior Shoot!